An elderly lady gets an unusual inquiry from a stranger about the room she wants to rent. Professor Marcus (Alec Guinness) explains to Mrs. Wilberforce (Katie Johnson) he is a member of string quintet and his four companions need a place to practice. Seeing no problem at all, Mrs. W agrees to the arrangement. However, Marcus and his pals are really criminals gathering together to pull off a heist and are looking to use the innocent Mrs. Wilberforce as an unwitting accomplice. After a successful crime the gang is ready to leave town with their loot, but when Mrs. Wilberforce discovers just what they’ve been up to it comes down to eliminating her before she can contact the police. Yet, that ends up being more difficult than they all think. The black comedy The Ladykillers from Ealing Studios was a hit with audiences and has gained a reputation as one of the great British comedies. In 2004 Joel and Ethan Coen direct an Americanized remake. This time out the setting is the American south and the strange border is Professor G.H. Dorr played by Tom Hanks. 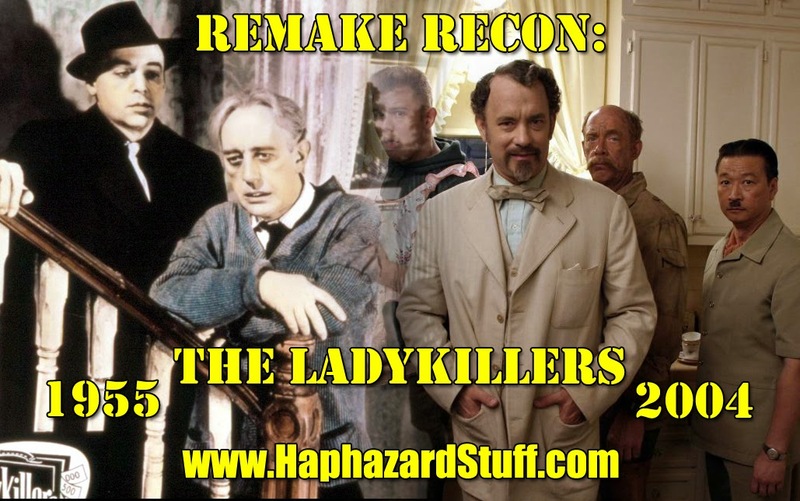 I take a look at the original 1955 comedy and the 2004 remake of The Ladykillers. Glad to see another remake recon. The Eailing comedies are some of the greatest comedies that the British film industry has ever produced. Filled with dark sardonic humour, wit, shady characters and situations that will leave an audience both in anxiety and laughter, the Eailing were the perfect vehicles to capture an old world charm that Britain yearned for, mixed with the pessimism of the post war era. The Lavander Hill Mob, Kind Hearts and Coronets and, especially, The Ladykillers are masterpieces. Alec Guinness yet again shows that he was one of the greatest British actors of his generation, Herbert Lom gives his twitches a rest and shows how both menacing and debatable he could be. Cecil Parker shows the depressing outcome of an English gent, whilst Peter Sellers displays his comedic talent that would prove to be a fruitful career. All in all, a brilliant film that shows how a pet bird could be so problematic. I really do not know what possessed the Coens to remake an Eailing comedy! If they wanted to re-introduce the sub-genre to American audiences, surely they could've saved a lot of time and money by checking out A Fish Called Wanda? A Fish Called Wanda is an obvious homage to the Eailing comedies, it has the wit and sardonic dark humour found in the genre, and it has been given a modern spin which works phenomenally well and is delivered by a stellar ensemble cast. Wanda is phenomenal film, it's hilarious, it's cruel and the characters are very memorable… and cruel. I remember the remake as the film that ended(for me at least) an impressive streak by Hanks of movies he'd starred in that I'd at least liked and many of which I loved. I thought his streak would go on forever so as soon as I heard he was in this one that was enough to sell me on seeing it. I ended up hating this movie(and I have yet to see the original). You're correct in that it simply isn't funny and ended up bring to an end one of the most impressive streaks any actor has ever had IMO. From 1992 to 2004 Hanks starred in a string of 14 impressive films(averaged 86% Fresh each on Rotten Tomatoes) and picked up 2 Best Actor wins(in a row, no less) and 2 other nominations for Best Actor. So this movie really earns my ire for that. The comedian Frankie Howerd has a small role as an agitated barrow boy, as does Kenneth Connor as a taxi driver. the beginning of the downfall for the Coen Bros (in my books)…just saw Hail Caesar…another stinker…what the hell happened to these guys?..